JUST AS A LOVER of a much-treasured novel approaches a big screen adaptation with a combination of nervousness and excitement, so it was for me with this fascinating new release of Henry Purcell interpretations and improvisations. For many years, it has intrigued me how the works of a celebrated English composer active some three hundred years ago can, today, maintain their resonance and their power to move – and this is exactly the approach taken here in this new release, Music for a While, by Christina Pluhar’s L’Arpeggiata. As a keen ‘Purcellian’, then – owning many fine recordings by such consummate performers as The King’s Consort with James Bowman, Susan Gritton et al (Hyperion), and William Christie’s Les Arts Florissants (Erato) – I was keen to discover these cross-genre re-imaginings of familiar classical pieces… and what a revelation! Amongst Mr Purcell’s many compositional techniques was the ‘ground bass’ – a repeating bass structure over which he magically wove the most beautiful and varied melodies (often requiring detailed examination to believe that the same, recurring bass line is employed throughout). For instance (although not from this collection), the countertenor solo of Be welcome then, great Sir (from Purcell’s welcome song for Charles II, Fly, bold rebellion) is later elaborated, at length, over the same three-bar ground bass with the most ravishing orchestral ritornello. It would therefore, I suggest, be perfectly possible that this composer of great choral and theatrical masterpieces (as well as secular and even bawdy drinking songs) might be enthusiastically open to such improvisation and invention. So, with theorbo, archlute and cornet à bouquet, amongst many others, and a fine ensemble of players and choral soloists (whose styles range from period to contemporary), L’Arpeggiata set out to interpret Purcell with inflections of jazz, world and even pop, but with remarkable integrity. A perfect example of the success of this project is Strike the viol (from the Birthday Ode for Queen Mary, Come ye sons of art away). The already melodious and dance-like brilliance of Purcell’s original, illustrating the soprano’s words ‘Strike the viol, touch the lute, wake the harp, inspire the flute’, are given the most glorious rhythmic guitar and percussion treatment, along with the excitement of trumpet, electric guitar, wailing clarinet and ’60s ‘light my fire’ organ! The transcendent Evening hymn is inventively transformed into a soft ballad with limpid piano over homely guitar and shimmering percussion – and whilst the crescendoing instrumental doesn’t quite hold the simple sacred reverence that Purcell intended, the bluesy piano and guitar here pleasingly demonstrate the improvisatory possibilities of these 17th/18th Century gems. ‘Twas within a furlong takes on a folksy, bluegrass feel, the animated words illuminated by shuffling percussion and mellow-but-lithe electric guitar; and the rhythmic vocal of Wondrous machine (from Hail! bright Cecilia) sounds positively contemporary alongside pulsating tom-toms and jazz-infused bass, guitar, trumpet and clarinet. The sublime and perhaps more well-known character of Purcell’s output is sensitively portrayed in delicate, yet modern readings of Music for a while (a beautifully constructed jazz clarinet-led version with walking bass) and When I am laid in earth, which maintains its irrefutable and poignant beauty via weightless percussion, piano and guitar supporting a beauteous soprano voice (I recall Sir Michael Tippett being so affected with Purcell’s musical longing of “ReMEMber me”). And so the album continues, with attractive and often surprising reworkings of these great compositions. Bonus track, Leonard Cohen’s Hallelujah, seems a little incongruous (unless it’s because I have never connected with this much-covered song, or don’t understand its relevance here). Perhaps I anticipated a ‘reversal’, with a very tight Purcellian treatment of this familiar late 20th Century hit – however, it is executed with the same attention to detail as the other sixteen tracks, and it could never detract from the overall ingenuity of this release. 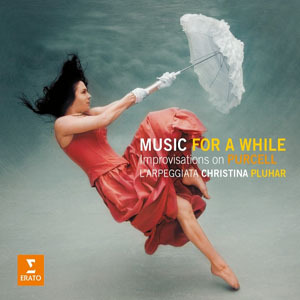 It is difficult to second-guess the audience for Christina Pluhar’s visionary project – but, as a confirmed ‘Purcell purist’, I am suitably impressed, finding myself listening over and over to its intelligent, compelling beauty. ‘Music for a while’ is released on 10 March 2014, available from Erato (Warner Classics) and all good jazz and classical specialists. A UK performance at London’s Wigmore Hall is scheduled for 10 July. Catch the preview video excitement here.